An important read for everyone in software development. Although the book is not executed perfectly, it raises the level of debate in the software industry from anecdotes and opinions to hard data and research. * Learning programming: Why is it so hard? Do better tools or visual programming help? 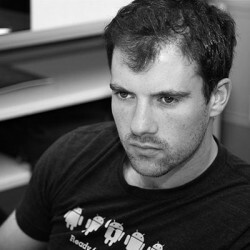 * TDD: Does it reduce bugs? Does it lead to better design? * Pair programming: Does it reduce bugs? Does it increase or decrease productivity? * Code review: Does it reduce bugs? Should you do it in groups or individually? * Women in computer science: Why are there so few? Is it due to genetic differences or cultural biases? * Team organization: Is Conway's Law something to avoid or embrace? This book is now my go-to source for a variety of software decisions. I just wish I had read it long ago. The reason for 4 stars instead of 5 is that the way this information is presented is not particularly compelling. Most of the chapters in the first half of the book, and a couple from the second half, are written in a dry, academic style that's too focused on the nitty gritty details of software research methodologies. I suppose that's OK if the target audience is other researchers, but my impression is that the goal of this book is to bring evidence-based software engineering to the typical programmer, and to do that on a large scale, you need a much more approachable writing style. In other words, if the goal of this book is to motivate change, then the authors need to pick up a copy of "Made to Stick" and learn to simplify the message (e.g. gloss over the research details), make it more concrete (e.g. explain what it means in the real world), involve some emotion (e.g. these are controversial topics, feel free to make some jokes or have an opinion every now and then), and tell stories (e.g. give examples of how these results affected an actual project). Overall, a very worthwhile read, but if you're not a researcher, be prepared to do a lot of skimming, especially in the first part. 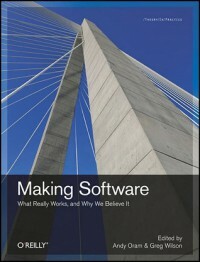 We hope the questions and answers in this book will change how you think about software development. We also hope these essays will persuade you to say, “Citation, please,” the next time someone claims that one way of laying out braces in C or Java is better than another. Evidence is not proof. In general, evidence is whatever empirical data is sufficient to cause us to conclude that one account is more probably true than not, or is probably more true than another. Qualitative research has to precede quantitative research and will look at situations that are more complicated. When only few different factors are involved (such as in physics), one can proceed to quantitative investigation quickly; when many are involved (such as in human social interactions), the transition either takes a lot longer or will involve premature simplification. Many of the credibility problems of software engineering evidence stem from such premature simplification. We found that programmers deviated from a reference group in that they are lower on Extraversion, lower on Emotional Stability, and higher on Openness to Experience. [...] Programmers are also more homogeneous than the population as a whole; that is, programmers vary less in personality than do people in general. This confirms the stereotype of programmers being neurotic, introverted, and intellectual—and, by the way, male (which I know for a fact some people consider tantamount to a personality trait!). It makes a significant difference whether you ask someone how much time he needs to complete a given amount of work, or whether you ask how much work he can complete in a given amount of time. Thus a possible corollary of Conway’s Law is: A software system whose structure closely matches its organization’s communication structure works “better” (defined broadly) than a subsystem whose structure differs from its organization’s communication structure.